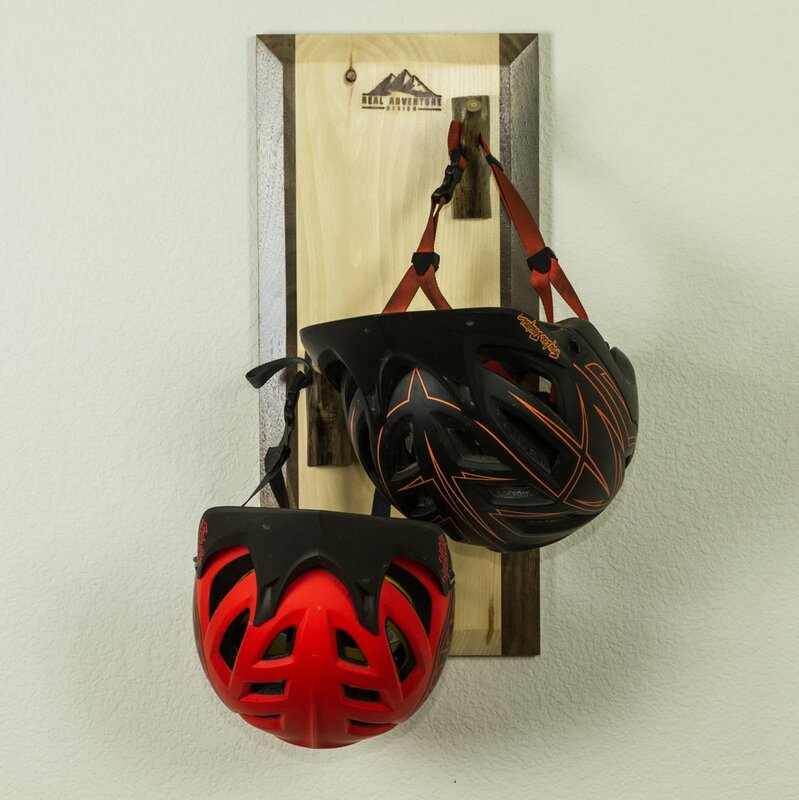 A stunning, rustic helmet rack handcrafted from premium materials. Fish Creek Falls drainage has some of the most technical backcountry skiing and biking in all of Steamboat. If you are up for the challenge, the terrain will make you thankful for the invention of helmets. Made from sustainable pine, walnut, and aspen branches the Fish Creek helmet rack will keep your helmets organized and within easy reach for your next adventure. Great for multi sport families. The Fish Creek looks great with the Meaden ski rack. Fish creek 2 helmet rack. 2 Helmet - 9" X 20"
4 Helmet - 9" X 36"
Contrasting Maple and Walnut will store your helmets with class. Sustainably Harvested aspen branch hangers are eye popping. Rustic pine and figured walnut. Installing the HelmetRak - two options. Decide where you want the rack to hang. Apply the Scotch mounting tape to the rack and press firmly into place for 30 sec, keeping the rack level (there are great apps for this). For more information on the mounting tape, go here. Pull out the included hardware pack, inside will be a drill bit, a driver bit, a template, and 2 screws. Decide where you want the rack on your wall. Mark the top left corner of where the rack will be. Remove the template and use the included screwdriver to install screws. Use the drywall inserts before screws if you did not hit a stud and the wood screws where you hit a stud. Leave the screws proud of the wall and test by slipping the rack onto the screws. If it is loose, pull the rack off and tighten a quarter turn. If it cannot slip on, loosen. Continue until you are satisfied with the fit.